(Newser) – The New Mexico Department of Health on Monday confirmed two more human cases of plague. The recent cases involve a 52-year-old woman and a 62-year-old woman. The first case this year was reported in early June in a 63-year-old man. All three patients, who live in Santa Fe County, were hospitalized but there have been no deaths. 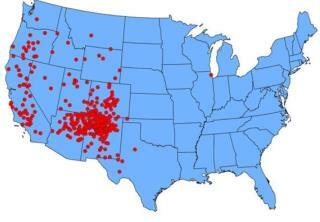 State public health veterinarian Paul Ettestad says plague can be present in fleas that infest wild rodents in Santa Fe County, including within the city limits of Santa Fe and in other locations around New Mexico. "Pets that are allowed to roam and hunt can bring infected fleas from dead rodents back into the home, putting you and your children at risk," he says. It does not sound as if this is a major change in the number of incidents. Increased population and density would account for the increase. I have one dog and two cats. So far I just cannot bring myself to make my pets stay indoors 24/7. It seems so cruel. The cats have nothing to do and my dog lives for the two times I take her out for a walk. The only thing I have to fight plague with is the cheap anti-flea/tick meds I buy. I sure hope they will continue to work. One other concern is that I live in a mountainous area here in California with coyotes trotting around the neighborhood every once in awhile. I am always relieved when the cats agree to come into the house before it gets dark. And let's not even go to another problem: one day about a month ago when I was walking my dog, I got a painful bite on my leg. I never found out what bit me. I cannot afford to have any kind of healthcare, but so far, I'm still alive. The pain went away, but the bite and the itching remain. Americans need to move NANCY PELOSI, ADAM SCHIFF, CHUCK SCHUMER, DIANNE FEINSTEIN OFFICES to this area out in the desert.